This shawl has so many stripes. The pattern calls for you to cut the yarn after each stripe. Instead, I’m carrying the yarn up the right-hand side when that yarn color will be used again. 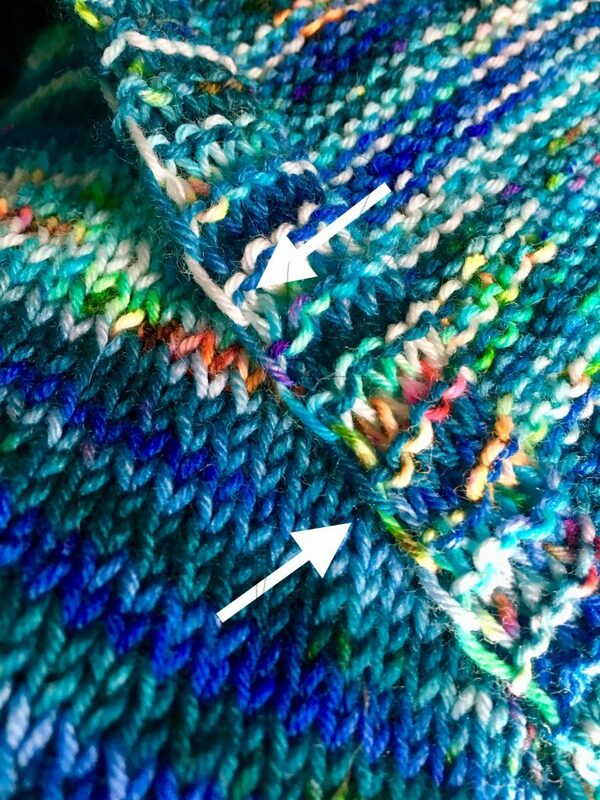 When doing this it’s important to ensure you cross your two yarns every other row in order to “catch” the carried yarn. Also, you should NEVER pull the carried yarn tight. Carrying the yarn up the side will minimize the number of ends I’ll have to weave in, and I hate weaving in ends. If you are working in Stockinette, I recommend slipping the first stitch of each row as this will help hide the carried yarn. here is a close up of the yarn carried up the edge. I’m at the point in the pattern that calls for knitting 46 rows in color #1. But I think I might run out of Color #1. Instead of knitting the 46 rows as instructed, I’m working my own series of stripes within the 46 rows. So, I’m mixing up the colors #4, #5 and #1. 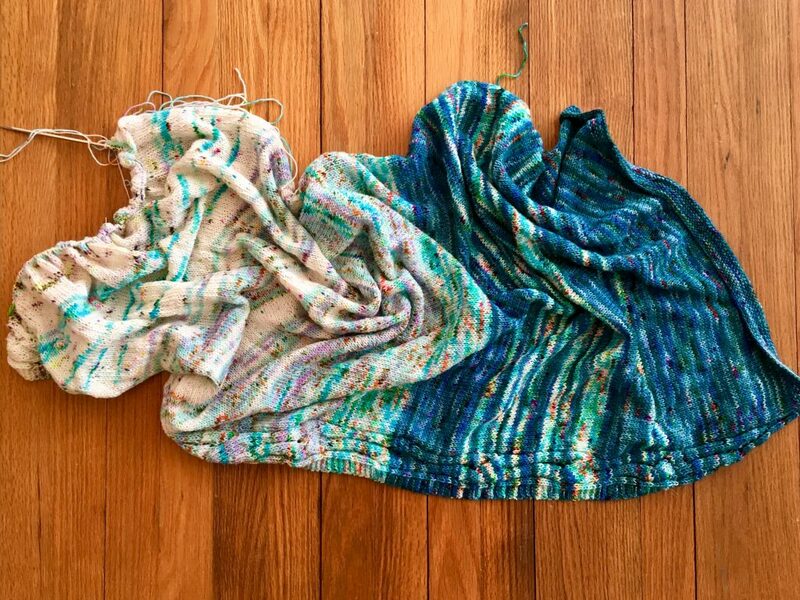 I have seen two finished shawls. One shawl I saw at Knit Night at Flying Needles. It was knit by a man named Taylor. He knit his shawl using oranges and purples. It turned out really nice. Another finished shawl I saw was knit by Lauren, the designer of the pattern. She was wearing her finished shawl at the anniversary sale. Lauren knit hers in the same colors that I am knitting mine. As a matter of fact, her shawl is why I picked the colors I did. And as a bonus, the kit had an exclusive color. Currently, I’m knitting more on the body of my sweater than my shawl. I have a couple inches until I start the cable section and the underarm gussets. Then it will require more attention. My shawl will return to TV knitting. Six people have this project entered in on Ravelry, including my own. Three are finished projects, three are works in progress. I intend to finish my shawl, changing the count to four finished and two in progress. 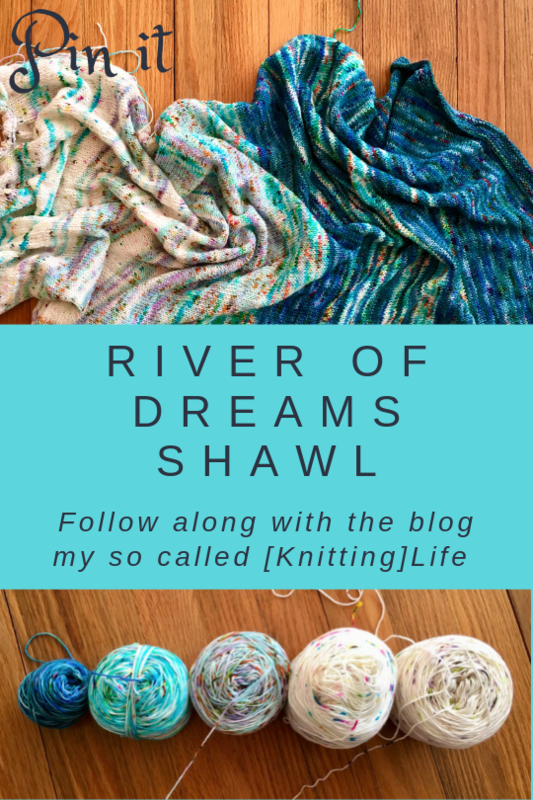 My goal is to finish the River of Dreams shawl by the end of February. This is totally doable. Plus, I can get back to knitting my socks and finish those for March. Obviously, the January Gansey sweater is intended to be knit within January. This won’t be finished in January unless I really pick up my pace. Better get on that. So gorgeous! I totally would carry the other color up the side as well! Weaving in all those ends would make me cray cray!! Beautiful! YoureY motivating me to learn to knit! Your work is inspiring! 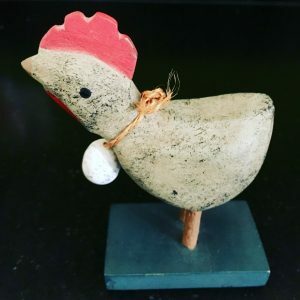 Plus you clean the coop daily!?! Thank you! Yes, I do clean it every day. I have sand on the floor and a poop deck under the roosts. Takes less than 5 minutes including checking the waterers and giving them scratch. You can see the layout in this older post. 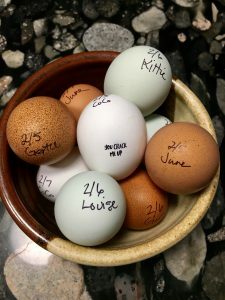 https://kymhretz.com/2018/05/09/spring-has-sprung/ I will have to do an updated coop tour soon. This is a captivating design! My knitting is not this advanced yet, but I’m working towards that goal! No no no! I know you said only takes five minutes to clean up the chicken poop but is that something I would not sign up for. Same reason I don’t have a dog. LOL I get so excited when I see all your wonderful projects because I then get inspired to finish my knitting projects. I miss having you help me in all my Knitting boo-boos but somehow I struggle through with a little help from knitting friends. Happy Knitting and as always I love hearing about life in your neck of the woods. I’m glad I’m inspiring you. I miss our Monday’s together the most. You’re so talented!! Can’t wait to see the finished product.